The United States Congress designated the Blue Range Wilderness (map) in 1980 and it now has a total of 29,106 acres. 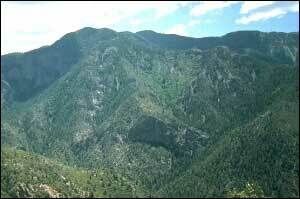 All of this wilderness is located in New Mexico and is managed by the Forest Service. Combine New Mexico's Blue Range Wilderness with Arizona's Blue Range Primitive Area and you have two pieces of earth that encompass a wild, generally dry, and seemingly endless expanse of rough but beautiful terrain. The state line is all that separates the two areas, with New Mexico's Wilderness tucked into the Blue Range Mountains and halved by the Mogollon Rim, a dramatic edge of the Colorado Plateau that runs east to west. Grassland foothills rise to juniper woodland and higher up to peaks forested in ponderosa pine, spruce, and fir. On occasion, just when you can't see the trees for the forest, the dense woods will give way to a mountain meadow or a cool aspen glade. The rock-walled canyons are narrow and steep, sometimes plummeting as much as 1,000 feet from their forested rims. By contrast, the sweeping reaches of stark land offer tremendous solitude and soul-stretching quiet, a silence broken only visually by ragged rock towers. Hikers may be discouraged by Forest Service reports that the few trails of the Blue Range have no dependable water source, and that trail markers aren't always easy to follow. However, if that doesn't deter you, consider crossing the Wilderness via the 8.8-mile WS Mountain Trail, which starts at Pueblo Park Campground, continues along the rugged Pueblo Creek and Bear Creek drainages, and ends in Arizona. Chances are you won't run into a single person, and there's something to be said for that. Planning to Visit the Blue Range Wilderness? How to follow the seven standard Leave No Trace principles differs in different parts of the country (desert vs. Rocky Mountains). Click on any of the principles listed below to learn more about how they apply in the Blue Range Wilderness.